Pumpkins come in many shapes, sizes, and colors. The most common uses for pumpkins are for jack o’lanterns as well as making pies. Jack O’Lantern pumpkins are most commonly “Connecticut Field” pumpkins or large Halloween pumpkins. They have a hard orange, smooth, and slightly ribbed skin. The varieties Howden and Jackpotare best for Florida. 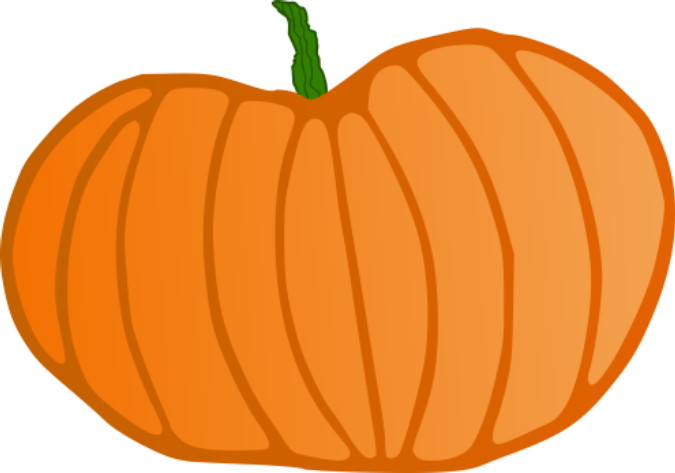 Small Sugar pumpkins are the most popular and most widely grown pie pumpkin. These pumpkins are round, flattened pumpkins and are small—averaging only 6-7 pounds. Most pumpkins need 3 1/2 to 4 months to mature, so they should be seeded by July 4th to be ready by Halloween. Pumpkins typically keep for a few weeks, but long time storage (1-4 months) is difficult in Florida due to the heat. Pumpkins are a warm season vegetable that should be planted in Florida in early July as they like warm soil. Pumpkins grow on vines and require 50 to100 square feet per 4-5 seeds. Seeds should be planted 1 inch deep and rows should be 10 to 15 feet apart. Once they begin growing, pumpkin plants should be kept free form weeds and should be irrigated if there is no rain for an extended period. Pumpkins do tolerate short periods of hot, dry weather. Bees are necessary for pollinating pumpkins but may be killed by insecticides. When insecticides are used, they should be applied in late afternoon or early evening when the blossoms have closed and the bees are no longer visiting the blossoms for the day. New blossoms open each day and bees land only inside the open blossoms, pollinating the pumpkin flowers. Pumpkins should be harvested when the are a deep solid orange and the rind is hard. If the vines are healthy, harvesting in late September and early October is ideal. Pumpkins should be cut carefully from the vine using pruning shears or a sharp knife, but 3 to 4 inches of stem should remain attached. Cucumber beetles & squash bugs—attack seedlings and vines and can damage mature fruits. Carving should be done by an adult or with adult supervision. Always place the pumpkin on a flat, sturdy surface and use carving kits as these contain tools designed specifically for cutting pumpkins. Utilize battery powered tea light candles or glow sticks to light pumpkins rather than candles with a flame. Offer children the option of decorating their pumpkins using glue, fabric scraps, paint and markers. Pie Pumpkins should be used for cooking. These pumpkins are smaller and the flesh is sweeter and less watery. When choosing a cooking pumpkin, make sure that it has 1-2 inches of stem remaining and that the pumpkin has no blemishes or soft spots. Shape is unimportant when cooking with a pumpkin. As a rule of thumb, figure one pound of raw, untrimmed pumpkin for each cup of pumpkin puree. 2. Pick through the seeds and remove any cut seeds. Remove as much of the stringy fibers as possible. 3. Bring the water and salt to a boil. Add the seeds and boil for 10 minutes. Drain, spread on kitchen towel or paper towel and pat dry. 4. Place the seeds in a bowl and toss with oil or melted butter. 5. Spread evenly on a large cookie sheet or roasting pan. 6. Place pan in a preheated oven and roast the seeds for 30-40 minutes. Stir about every 10 minutes, until crisp and golden brown. 7. Cool the seeds, then shell and eat or pack in air-tight containers or zip loc bags and refrigerate until you are ready to eat. Kristie Popa is the 4-H Extension Agent in DeSoto County. She received her bachelors degree in Elementary Education from Florida Gulf Coast University and her Master's Degree in Agricultural Education and Communication.